Did you know that the US dollar essentially held its value until 1913? And that today's dollar can purchase what a nickel could purchase in 1913? All Americans are concerned about taxes, spending and debt. But our flawed monetary system is the source of this disaster. The monetary system is the life's blood of a big Federal government and a great comfort to bankers. If you'd like to know more, you have come to the right place. Note: For Quick Access to our FAQs & Blog Articles, Download our free APP from Google Play or the iTunes Store. Download "Build111" and enter stopprintingmoney.com when prompted. America is great, with natural resources and hard working, intelligent citizens. The problem is our monetary system. We have managed to evolve into a system that is easily abused by bankers and government, and it is that abuse that has created the financial and economic crisis we are living through today. Fixing this broken monetary system is of as much importance to you as revising the taxing and spending policies of Congress. 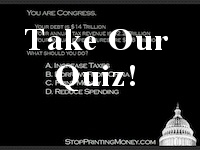 Taxing and spending will take care of themselves if we stop Congress' ability to use the Fed to monetize debt. Not surprisingly, there are monetary systems available that cannot be used by the government to fleece its citizens and this amendment will set us on a path to adopting one of those. Some other terms for monetizing you may have heard include printing money, inflation, hidden tax, regressive tax, debasing the currency, quantitative easing, expanding the money supply, elastic monetary system, central banking, money out of thin air, counterfeiting and more. The structure of the monetary system has been a problem for over 200 years (learn more), but abuse of that system accelerated rapidly with the advent of the Fed. There is a way to repair the monetary system and prevent this trend from continuing. All Americans are being robbed by this system regardless of political affiliation. The Essence of the Problem is Monetizing Debt. The Decisive Action is a Constitutional Amendment to prohibit monetizing debt. The Pain and Sacrifice is unavoidable, but if we do not act now, it will be much, much worse. America currently has $18 trillion in debt on the books and another $70 trillion or so in unfunded entitlements and pensions that are not yet on the books. These debts will never be repaid with dollars at current value. Either America will devalue its currency through inflation or it will default on its promises and bankrupt. Inflation effects every single American dollar equally which means the less income you earn, the greater the effect on you. As such, inflation is exactly like a regressive tax and monetizing debt has the same effect as counterfeiting. Our country is great but our economy is not healthy because of the monetary system that is in place. Our economy can be great again because we still have raw materials, labor, technological know-how, businesses and infrastructure in place. All we need is an honest monetary system that cannot be manipulated and expanded by the whims of Congress. Congress should be able to get all the money it needs by borrowing and taxes, but it should not be allowed to steal by getting the Fed to monetize debt. This amendment must come from us through the States. Both the citizens and the states are directly affected by it. Congress will not do it for us because it has a huge incentive to avoid losing the right to monetize debt. Learn more. "I wish it were possible to obtain a single amendment to our Constitution. I would be willing to depend on that alone for the reduction of the administration of our government to the general principle of the Constitution; I mean an additional article, taking from the federal government their power of borrowing." ~ Thomas Jefferson, Letter to John Taylor, November 26, 1789. Quoted by Martin A. Larson, The Continuing Tax Rebellion (Old Greenwich, Connecticut: Devin-Adair, 1979) , p.xii. Jefferson wanted to stop Congress from borrowing at all. This amendment at least stops their power of borrowing through monetizing (printing money with nothing backing it but you and me).